By now, you’ve surely clocked eyes on the official first teaser for Star Wars: The Last Jedi. Disney and Lucasfilm lifted the lid on Rian Johnson’s blockbuster at last weekend’s Celebration event in Orlando and since then, not a day goes by without a fresh wave of rumors spilling onto the interwebs. The latest purportedly offered some context to Ahch-To’s alien wildlife and a heartfelt reunion (more details here), but today’s news item comes directly from the horse’s mouth: Rian Johnson. 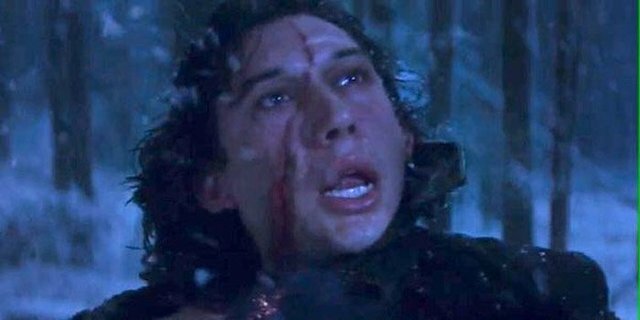 Taking to Twitter (via CBM), The Last Jedi‘s writer-director confirmed what many had already assumed: the scar on Kylo Ren’s face is slightly different to the one seen in The Force Awakens. Adam Driver’s mercurial warrior appears very briefly in the trailer, seen staring down the beam of his crossguard Lightsaber. But it didn’t take long for eagle-eyed fans to notice that the war wound he suffered while battling Daisy Ridley’s Rey had been altered ever so slightly. Turns out that executive decision came from Rian Johnson himself, who believed that a scar running up the bridge of Kylo Ren’s nose would have been too “goofy” to be taken seriously. With his Vader-esque helmet lying in pieces, chances are we’ll be seeing much more of Adam Driver’s malevolent villain by the time Star Wars: The Last Jedi zooms into theaters in December, when his journey over to the dark side of the Force will no doubt continue unabated. In many ways, Supreme Leader Snoke helped pull the strings behind that transition, so it’ll be fascinating to see whether Johnson’s sequel will allow Kylo Ren to meet Andy Serkis’ imposing menace in the flesh. Star Wars: The Last Jedi is slated for release on December 15th and, for the sake of comparison, we’ve included those two aforementioned pics of Adam Driver’s glowering Kylo Ren down below.